This guide describes how to wireless connect a CNC machine to a PC using WiFi, thereby being able to send programs from the PC to the CNC machine. 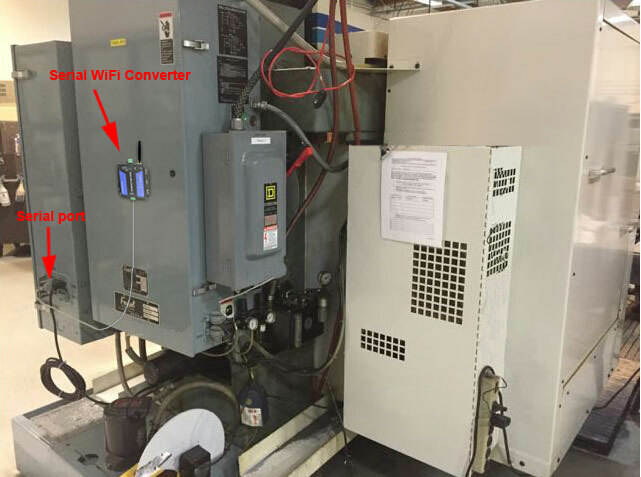 To be able to send programs to your CNC machine over WiFi you will need to connect a Serial to WiFi Converter such as the WF5000B from U.S. Converters LLC to your CNC machine. This will allow you to communicate with your CNC from a PC for up to 300 feet. As in any regular WiFi network you can use signal repeaters/boosters or Access Points to extend the range. If your CNC machine has a 9-pin female serial connector then you can connect the WF5000B directly to your CNC with a null modem 9-pin serial cable (included with the WF5000B). 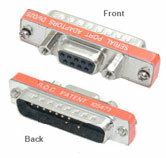 If the 25-pin connector on the CNC is a male version then you will need a 25-pin female to 9-pin female adapter. Start by connecting the WF5000B to your CNC’s serial port and also turn on the 5VDC power supply to the WF5000B (120VAC/5VDC power adapter is included with the WF5000B). Write down the settings, you will need them later. In this example the settings are: 115200, none, 1, 8. We highly recommend a good quality USB WiFi dongle such as Cisco, Linksys, Asus, Belkin or similar. Alternatively it is possible to communicate with the WF5000B through a wireless router. Please refer to the section called “How to connect the WF5000B using a wireless router”. 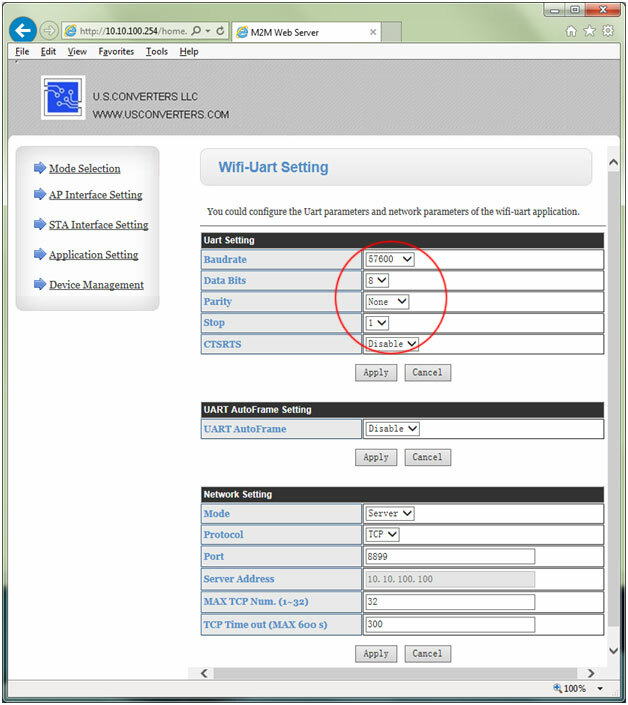 Now your PC needs to find the WF5000B on the wireless network and then you need to configure the WF5000B’s serial port parameters so they match the CNC’s port parameters. This is described below. 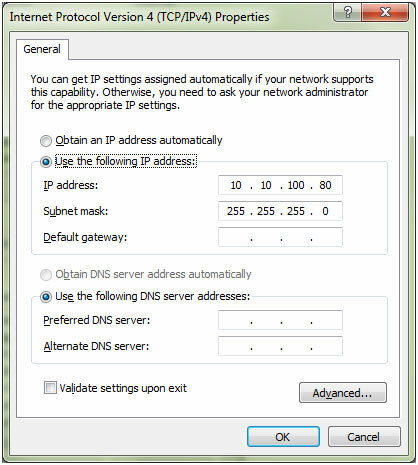 Once your computer is connected successfully to the WF5000B you can open a web browser and enter the WF5000B’s IP address which by default is 10.10.100.254. A login window will open. Enter the user name and password. 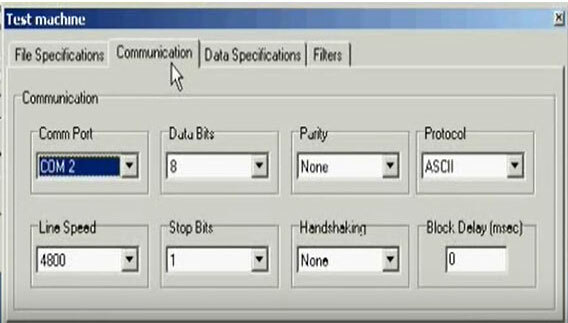 In most cases you can keep all default settings except the serial port parameters. 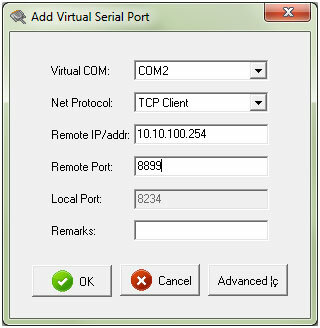 To create a virtual COM port in Windows which your CNC software can use to send programs through, you need to use a virtual COM port software. 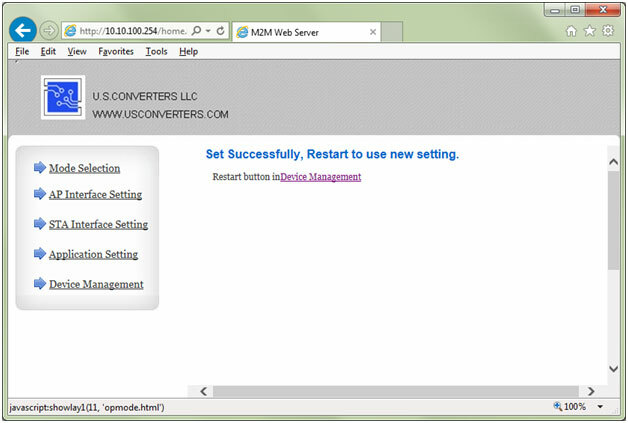 This software can be downloaded for free from www.usconverters.com. 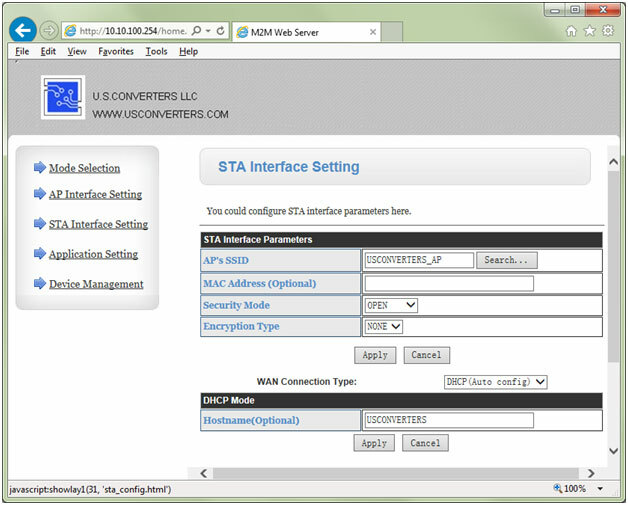 The software is called USR-VCOM. You should now be ready to send programs wireless from your PC to your CNC machine over WiFi. If for any reason you are unable to communicate or send programs at this point, we recommend troubleshooting by making a loop-back test as described below. 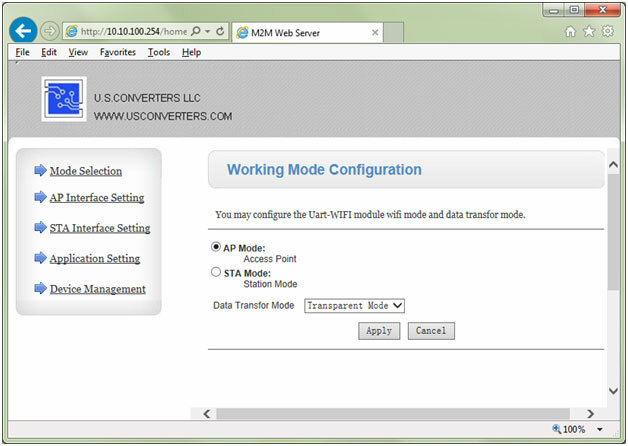 The setup procedure for connecting multiple CNC machines to one PC is the same as for connecting one CNC machine to a PC. One WF5000B must be connected to each CNC. 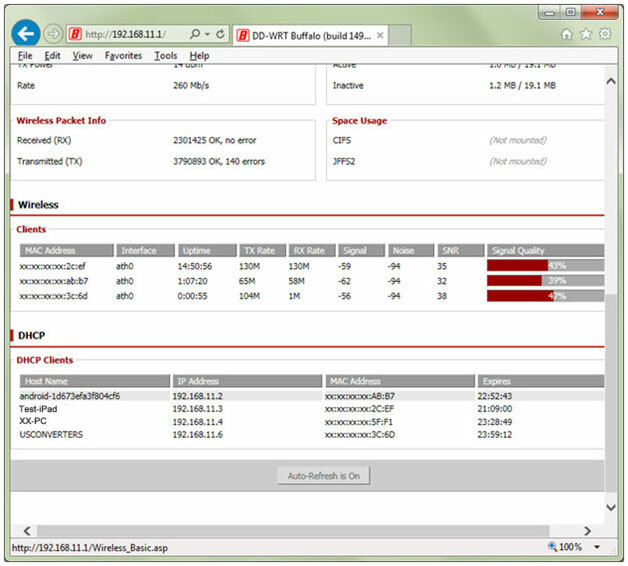 Your PC’s WiFi will search and find each WF5000B. 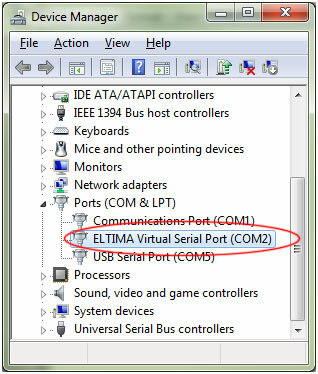 The virtual COM port software for the WF5000B will create a COM port for each WF5000B which your CNC software on the PC can use to send programs through. 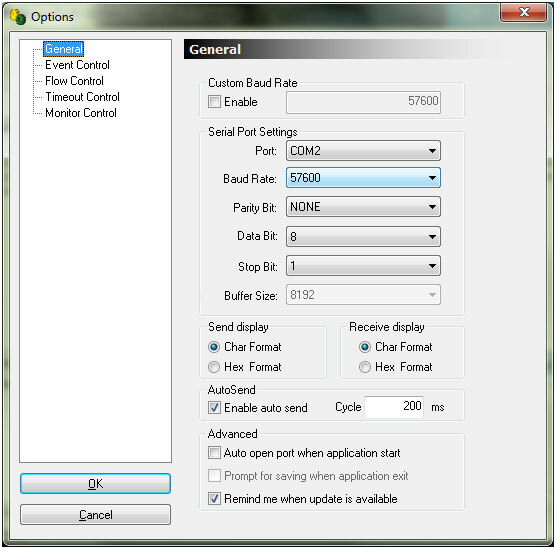 Once each WF5000B is connected and setup the user would need to select the correct COM port in the CNC software on the PC to send a program to a specific CNC. Very easy and convenient. 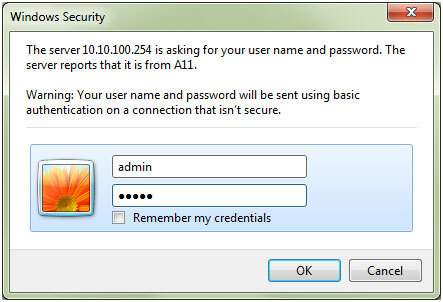 Check that the wireless router settings are correct, enter the password and click the “Apply” button. 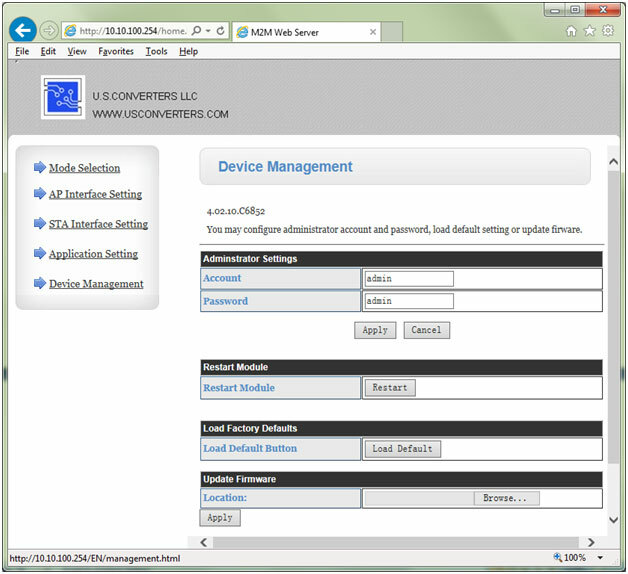 Do not go to the Device Management page and reset the unit yet. 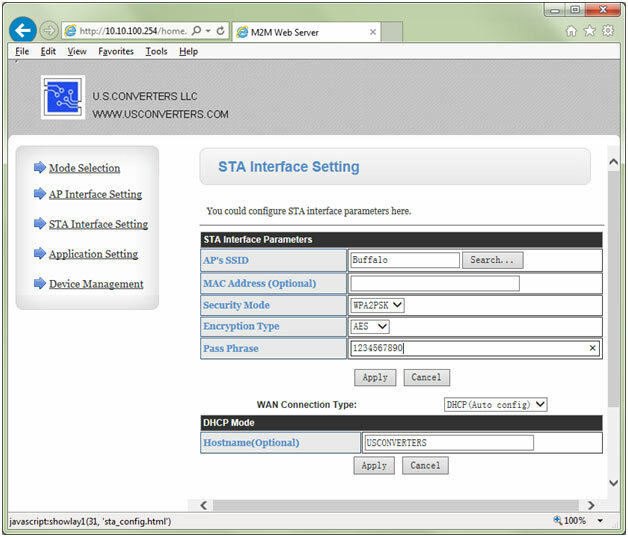 Go to the Mode Selection page, select STA mode and click the “Apply” button. Now go to the Device Management page and reset the unit. Click the “Restart” button for the changes to take effect. After the reboot is complete the “Ready” light will be steady on. 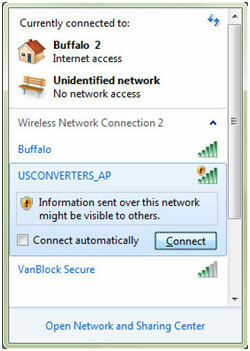 If you have entered the correct network settings and password then the converter will now automatically join the network, and the “Link” light will be on. To become familiar with the WF5000B or to troubleshoot if something is not working as expected, we recommend making a loop-back test. 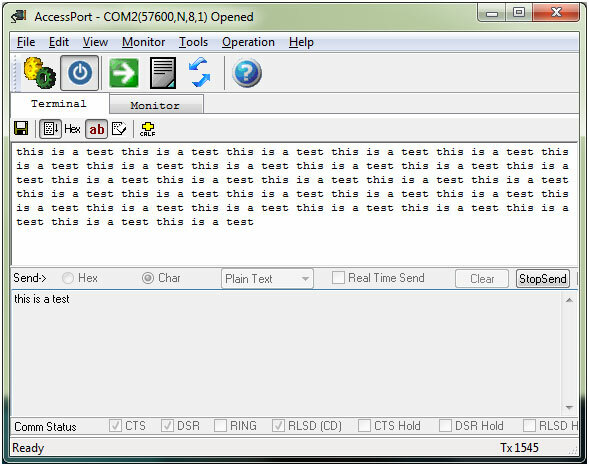 This will confirm if the WF5000B is working properly and the COM port has been successfully created in Windows. 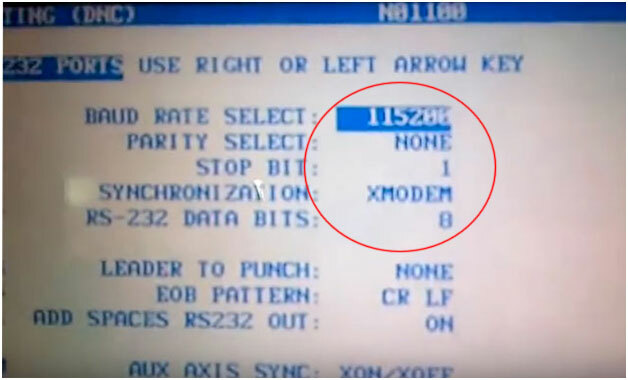 Disconnect the WF5000B from the CNC’s serial port and carefully use a paper clip or similar to jump the RX (pin 2) and TX (pin 3) pins at the end of the included null modem cable and connect the cable to the WF5000B module’s DB9 connector. 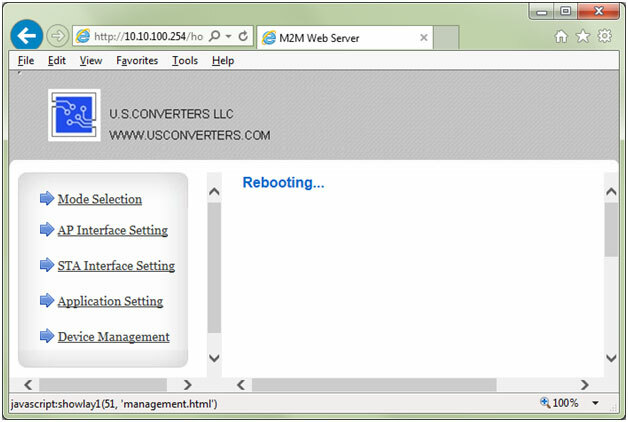 Open AccessPort (can be downloaded for free from http://www.usconverters.com). The port will now open. 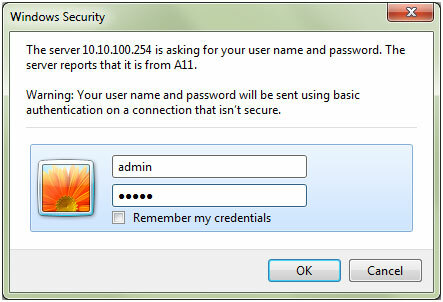 Enter a text string in the lower (send) window in AccessPort and click the AutoSend button. The characters should now be sent via virtual COM 2, over WiFi to the WF5000B module, out on the TX pin, back into the RX pin, back over WiFi, back into virtual COM port 2 and should appear in AccessPorts upper (receive) window. If you remove the jumper at the end of the serial cable connected to the WF5000B the data flow should stop. The WF5000B obviously should be connected over WiFi to your computer when performing this test. 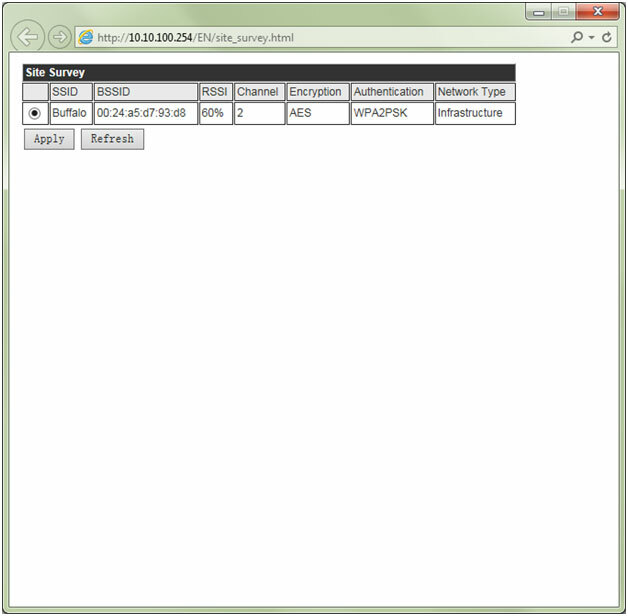 Making this loopback test will confirm that the COM port has been successfully created and that the WF5000B can send and receive data, ensuring that the module has been setup correctly. 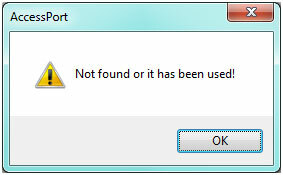 If you try to open the port but it is already in use or otherwise occupied by the operating system you will get the following error message from AccessPort. Using a different port is the easiest solution.